Whether you run your own business or work for someone else, it is easy to fall into the trap of working long hours. When the 5pm clock strikes, you are the one still at your desk, with head down for another hour or two. This might be OK now but what happens when this becomes a routine and your work-life balance starts to skew? Even when you get home, are you worrying about work left undone or that phone call you didn’t have time to make? If this is you now, it shouldn’t be and it doesn’t have to be. Maintaining a healthy work-life balance is essential if you are not to suffer from burnout, both mentally and physically, we all need to take time out to refresh ourselves. The question is, can technology help us? Can unified communications solutions provide the answer, so that even when you are not in the office you know exactly what is going on? The answer is yes, but what exactly is unified communications? UC is the business terminology used for business communication solutions that integrate or unify different modes of communication into one. This could be a hardware or software that provides chat facilities, access to data, video calling, desktop sharing, file sharing, VoIP telephony, fixed mobile convergence and literally any other form of communication method on any device. With UC in place, you can feel far more relaxed when out of the office, knowing that you are still in touch with everyone at the click of a button. If you constantly get bogged down with manual tasks, making use of the cloud-based solutions could automate many of them. Once you get the hang of unified communications system, intra-office communication will become streamlined, giving you access to everything at your fingertips. You will forget calling the Marketing Manager to find out the current status of a project – with UC you can view it yourself, as all key data will be stored in one central place. You will have more time to take a step back and look at the big picture and spend less time getting bogged down with unnecessary details. And don’t forget about data storage and security. Making use of the power of the cloud, all information will be secure and automatically stored and backed up so there is no problem with lack of recorded data. What happens when you leave the office before 5pm because your presence is needed at home? With UC the same information can be accessed from anywhere so you never need to worry about work left unfinished; instead you can stay with family with a free and uncluttered mind, even working from home on the days you choose. You can talk to customers and collaborate with colleagues at any time and any location that suits you. It gives you total flexibility and mobility and allows you to access data on any device, which increases your productivity as if you were working from your office desk. 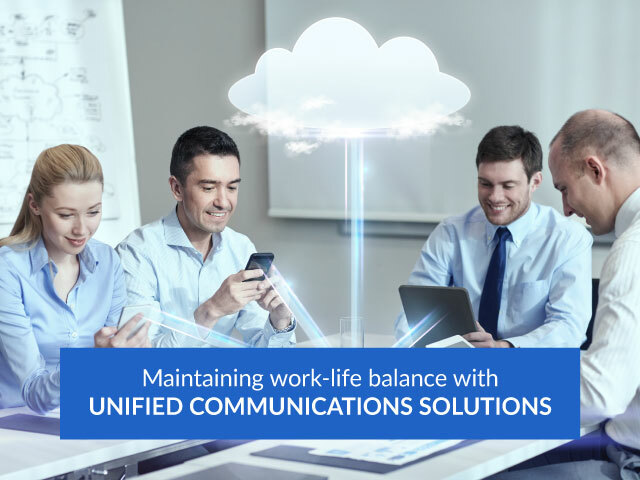 Unified Communications solutions truly can enable all business owners and employees to maintain a healthy work-life balance. Take the time now to find out how a UC system can free up your valuable time and minimise every day stress of your working life.